Posted on January 10, 2018 at 3:36 pm. 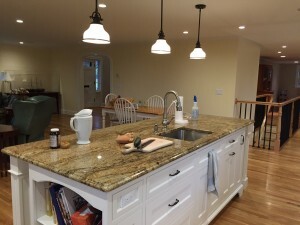 The project in the images below was a pretty major renovation/addition to a home. The client added onto the side of the house expanding the kitchen & living room areas in order to incorporate a garage below. 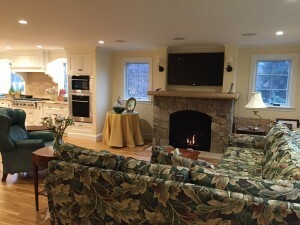 The before and after shots are fantastic and show a dramatic change in the two major living spaces. 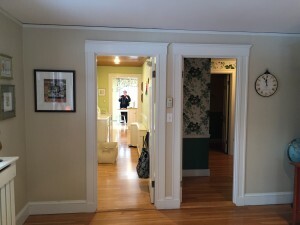 The kitchen and living room were once separated by a wall and you had to walk around the stairs and through the foyer to get from one space to the next. Once that wall came down and the two spaces became one, it became an entertainers dream! 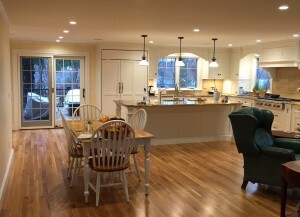 Family functions and gatherings would be much more inclusive and the flow of the home works so much better now that the living spaces are on a more open plan. You can see major change in these two photos. In the before photo, you can see the wall on the right that divided the living room and the kitchen which was completely removed. The far wall with the three windows was pushed out over the driveway to allow for more interior space. To give a good idea of placement, the new slider doors are positioned where the old sink used to be. These two photos are taken from almost the same spot before & after the renovation. The stair location did not change; it was just opened up and highlighted in the new design. Again, a couple of walls were taken down which opened up the space incredibly. 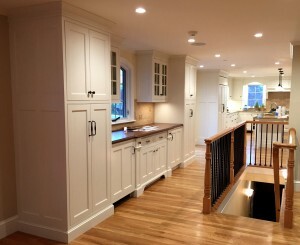 The cabinets with the wood top are the perfect location to take on some overflow from the kitchen. 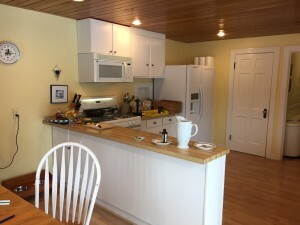 They provide an ideal location for a food serving area during a party or for a bar area where mixing drinks can be done outside of the busy kitchen. Adding a second trash and an under counter refrigerator assures that you will have everything that you need at a close proximity. This angle shows the new flow for the kitchen versus the old flow. The original kitchen was sort of a dead end with only one interior doorway in. 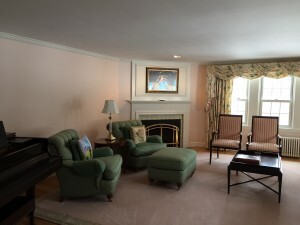 By removing the wall that was shared by living room the entire space becomes much more organic. This last angle here is a shot of the original living room, and then showing how open it is now that the wall has been removed. The clients chose to have the fireplace squared off and it brings the two areas together, yet still defines the living room as its own space. 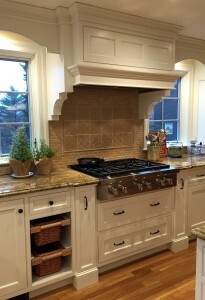 This image is a close up view of the range and hood, because… well, I like it! 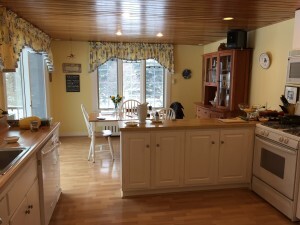 I hope that you enjoyed our tour of a home before and after a kitchen renovation. If you would like to see more, please give us a call or stop into our showroom during our business hours.